The screens blend in well and it is sometimes easy to forget that they are there. To prevent you from almost walking through the screen (believe me, it WILL happen) place a few small pieces of tape on the screen at eye level (adults and kids height). Retractable screen doors and spring-loaded blinds operate on a similar manner, blinds go up and down while screen doors are pulled across. Retractable screen doors have a flexible fiberglass screen that rolls up, and can be custom fit for almost any opening. It is important how and where the door is installed. They are either surface mounted or inside the door frame. The latter method may be the best. I like the concept of a retractable screen door. Compared to a few years ago, when it was a rarity to see a retractable screen door, they are becoming very popular for a number of reasons as listed below. * Provides excellent cross ventilation, while keeping out flying insects. It also is a good way of cutting down the time for air conditioners to run. * It can be stored out of the way when not needed. * There is no hinged door that requires swing space. 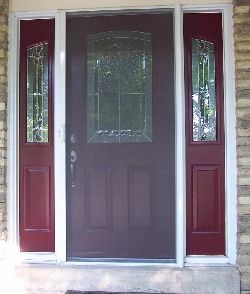 * This is a top to bottom full screen door providing ample ventilation and a full view of what is going on outside. * Some retractable screen door kits purchased at your local home improvement center come with poor instructions. * A retractable screen door will make the door opening a few inches narrower. This may be OK for normal use but not if you have to move large things like furniture or appliances in or out of the house. Of course it would take too long to remove the door temporarily. * Some installation videos make it look TOO easy and don't explain all the different scenarios you may run into. * Surface mounted retractable screen doors on door frames that are between extended brickwork may provide some installation problems. The door trim is not always thick enough to provide adequate support for the mounting screws. There is virtually no maintenance required to keep your retractable screen door in good condition. Just keep the bottom track clean to keep the pull bar from dragging in dirt. 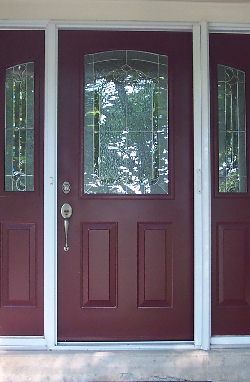 If possible talk to someone who has installed his/her own retractable screen door or go online and check buyers comments about the door they purchased and installed. You will be amazed at what can go wrong. Unless you are good in solving problems and handy with tools you may want to consider hiring a professional to install the door. The best installer would be one working for the door manufacturer.